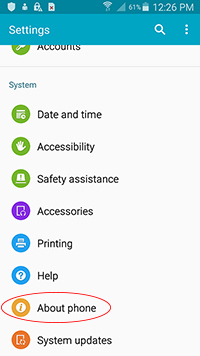 If you are having issues completing a mobile deposit on your Samsung device you may need to adjust your device settings to resolve the issue. We have listed steps on how to complete this below. All steps must be completed in the following order for the device to successfully allow mobile deposit functionality. Force close the Redwood Credit Union app on your device. You will need to enable the Developer options within your settings. 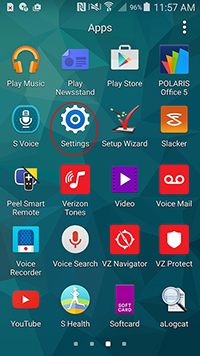 If you already have the Developer options enabled skip to the next step. 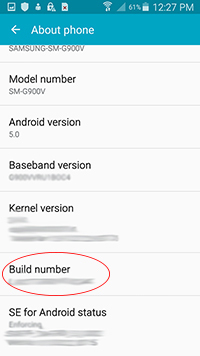 To enable the option go into Setting > About phone > Tap Build number - 7 times to enable developer options. 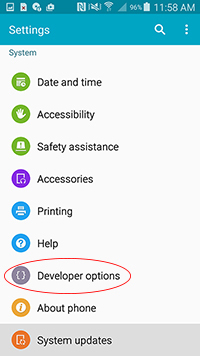 Once enabled you will see the Developer Options icon above the About Phone icon. 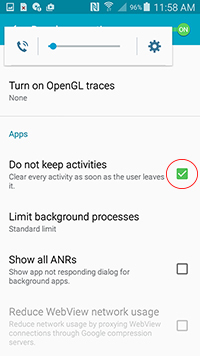 Select Developer options, and check/select Do not keep activities, so that Do not keep activities is on and exit the settings menu. Try a mobile deposit, which should fail, then force close the app. Next, go back into settings and uncheck Do not keep activities. The Do not keep activities setting will need to stay unchecked going forward to allow the mobile deposit functionality. Please retry your mobile deposit and verify it can now be completed successfully. Note: This problem can also be memory related. You may need to restart your phone to allow these settings to be effective. If you would like assistance, please contact our Member Service Center at 1-800-479-7928 (Monday through Friday 7 a.m. to 8 p.m. and Saturday from 8 a.m. to 5 p.m.).